Long-rumored Apple carrier partner China Mobile has begun readying advertising materials for 3G variants of Apple's iPhone 5s and 5c, according to a new report out of the middle kingdom. 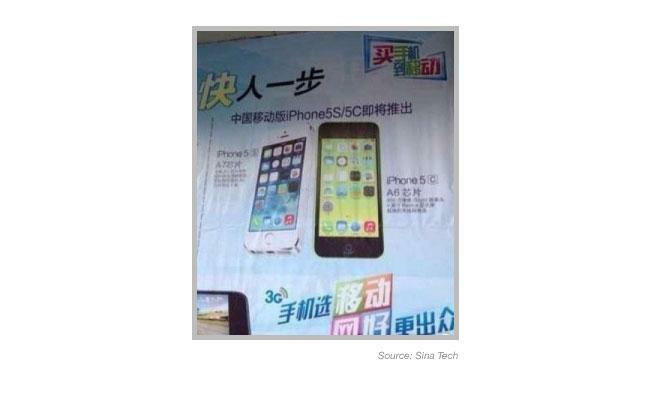 A poster advertising the upcoming availability of the iPhone 5s and 5c from China Mobile has been spotted on the mainland, according to Chinese media conglomerate Sina's Sina Tech. If legitimate, the poster would represent the first official acknowledgement of the long-rumored deal that would send Apple's iPhone to the world's largest mobile carrier and its 740 million subscribers. The poster touts the 3G variant of the newly released handsets, suggesting that the carrier may be angling to open sales of the devices sooner rather than later. While the iPhone has gained approval from China's Ministry of Industry and Information Technology to operate on China Mobile's 4G TD-LTE network, the Chinese government has yet to issue 4G operating licenses to carriers and there is no word on when those licenses may be handed down. As a result, China Mobile must either wait for the government to approve its 4G operations and risk losing further revenue-inflating iPhone sales to rivals China Unicom and China Telecom or begin offering the iPhone only on the company's 3G TD-SCDMA network. The report speculates that China Mobile will choose the latter course, enabling the iPhone's 4G TD-LTE capabilities with a software update after the proper operating licenses are granted. The flagship iPhone 5s, featuring Apple's updated A7 processor, new Touch ID biometric security, and redesigned camera —along with the mid-range iPhone 5c with its new, colorful polycarbonate shell —have amassed record-breaking sales numbers in their first weekend of availability. Last week's release was the first in which China was included as a launch country, and reservations for purchase of the new smartphones were quickly depleted across the country.